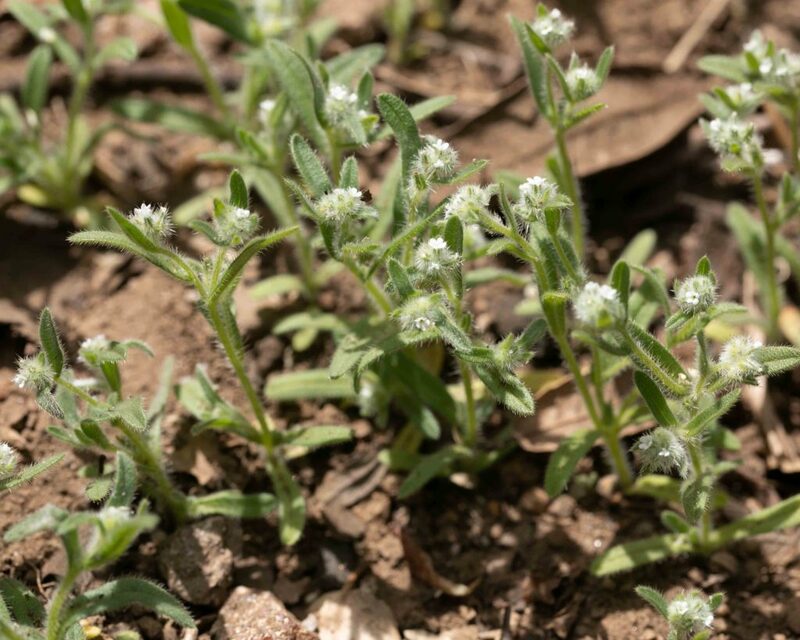 Popcornflowers are extremely challenging to identify in the field. 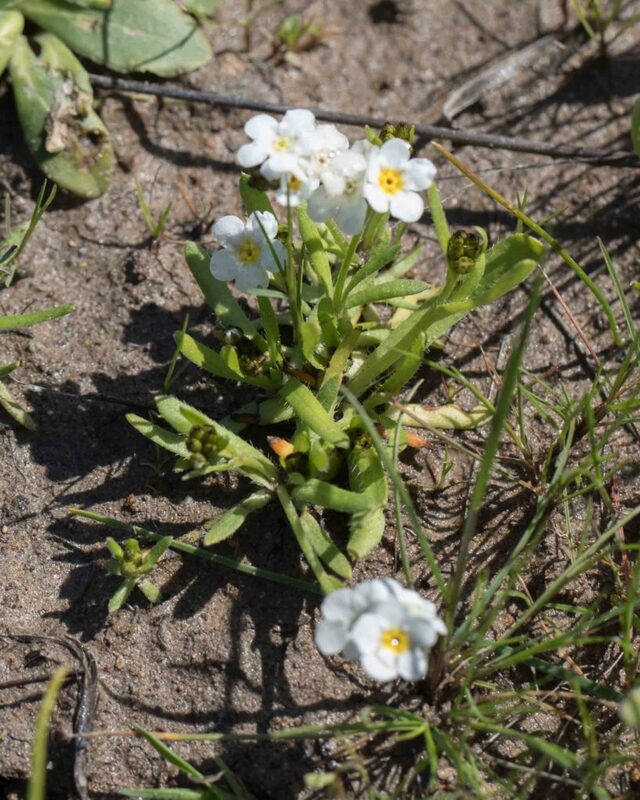 All of them have very similar white flowers, varying only in size and in the appearance and color of the “appendages” (at the base of the corolla lobes, sometimes yellow, sometimes white and occasionally completely absent). Too much reliance should not be placed on the color of the appendages as these can often vary on the same plant or even in the same flower head. 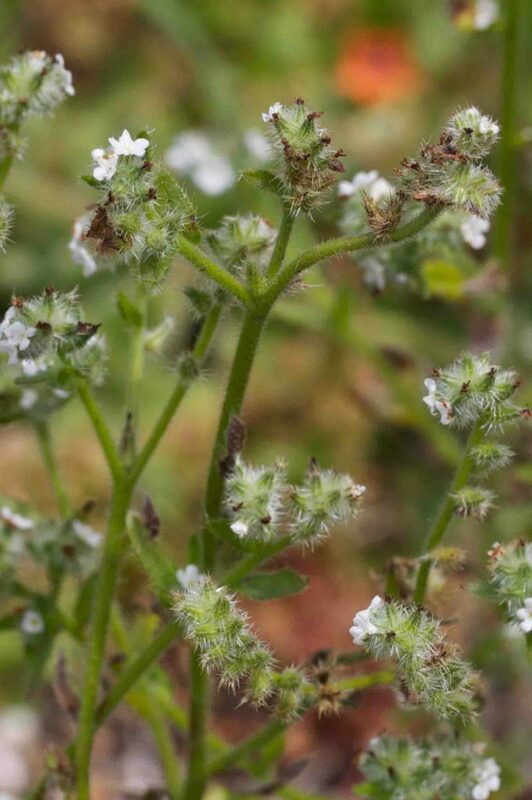 The growth habits, size and hairiness of the plants cover a wide range, and it can be hard to make a determination based on these given how variable individual plants can be, even within a particular species. The key distinguishing characteristic is to be found in the nutlets. 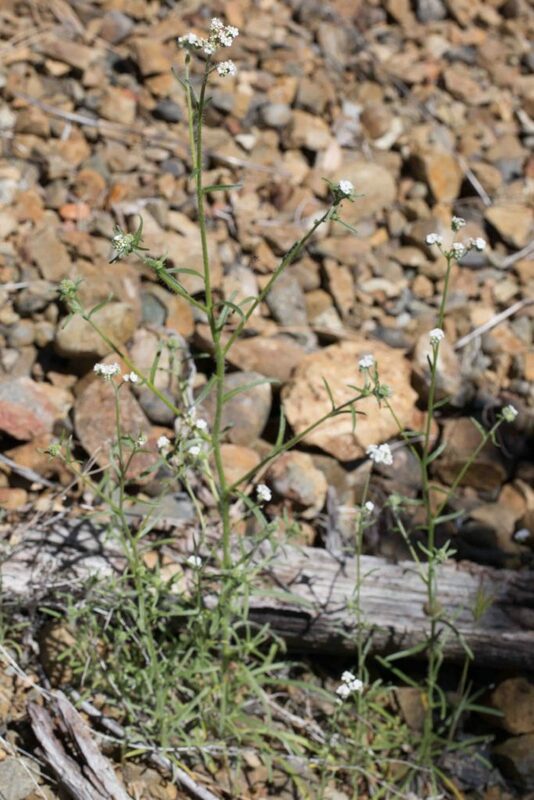 First, the distinction between Cryptantha and Plagiobothrys is that the inner surface of Cryptantha nutlets has a distinct longitudinal groove. Plagiobothrys nutlets lack this groove but instead have a distinct attachment scar below the middle of the inner surface. 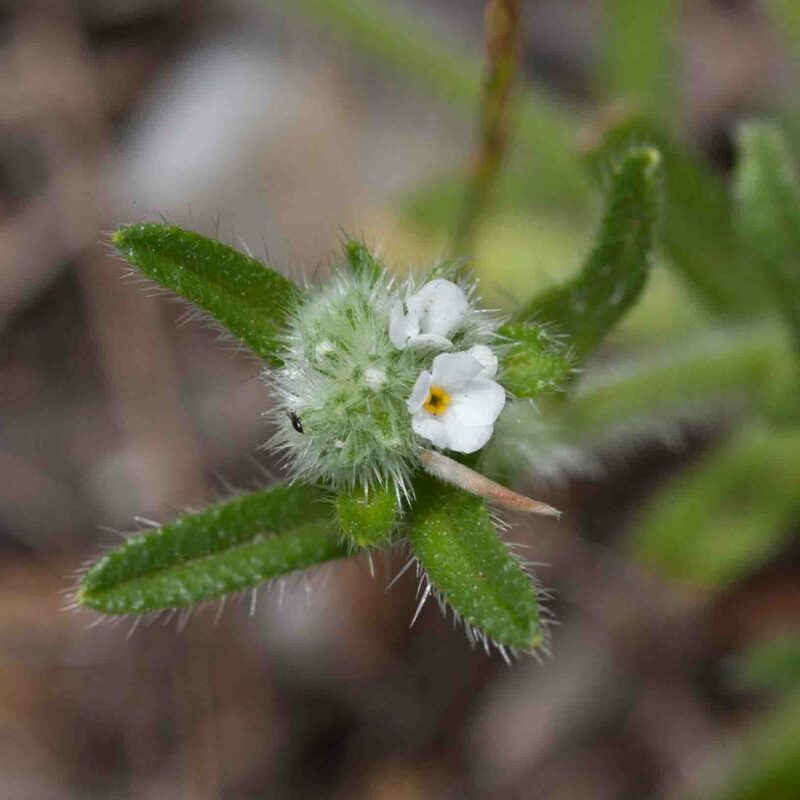 Secondly, especially within the Cryptantha, one has first to ascertain the number of nutlets (between 1 and 4) and whether they are rough or smooth, and then examine their individual shapes. The problem is that the nutlets are all small, sometimes very small, and it is almost impossible to come to any conclusions without the aid of a microscope. With Plagiobothrys, one can narrow the choices by seeing whether a plant has any opposite leaves. 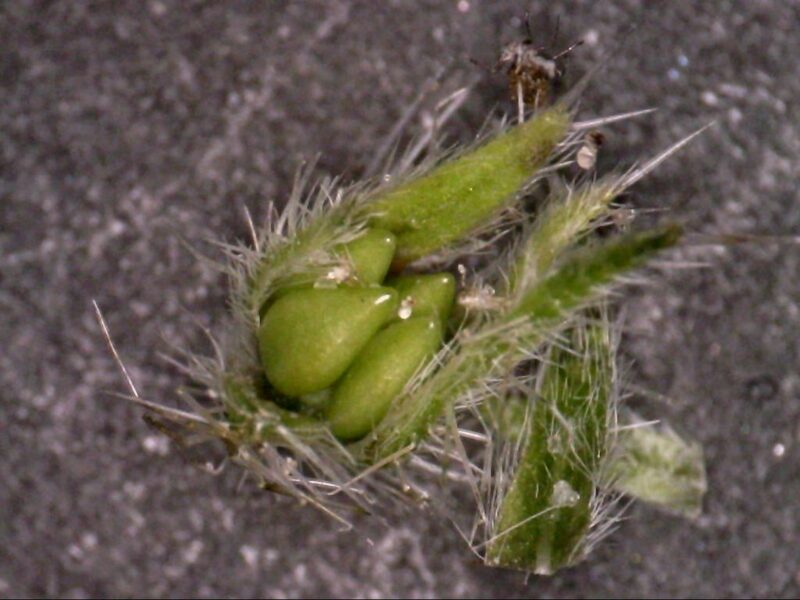 One of the most common, the Rusty Popcornflower (P. nothofulvus) has another unusual characteristic — the calyx is circumscissile in fruit, meaning that the top separates from the base like a lid. Nutlets are generally 4 in number, variable in their shape and appearance. 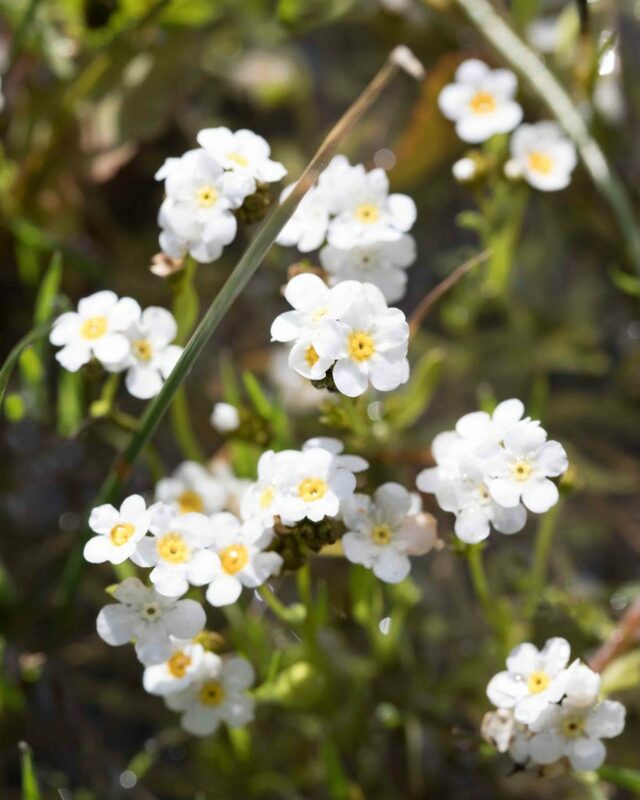 Enjoy these pretty little flowers but be warned that you will need the aid of a proper botanical key, a microscope, and a good deal of practice if you want to identify individual species with confidence. This page illustrates a small number of species, more to show some of the variations than to act as a guide to identification. 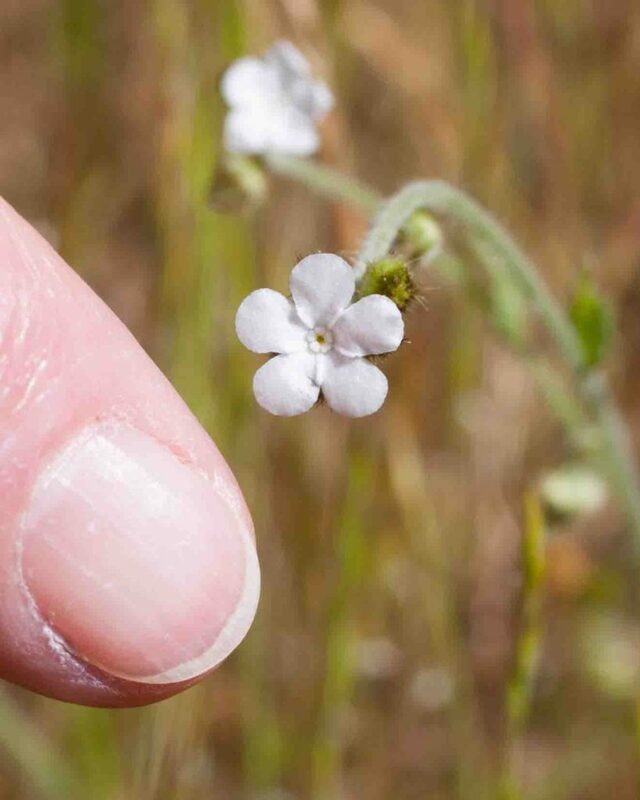 The fingernail is included in some of the photos for scale; it is exactly 1 cm across at its widest point. 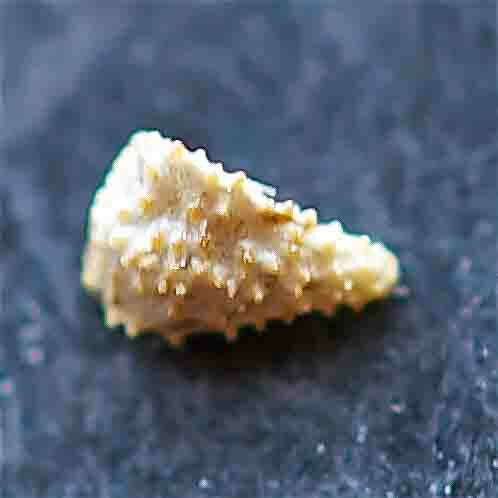 The nutlets of this species are easier than some to identify, 3–4 in number, lance to triangular-ovate in shape with fine to coarse, sharp bumps. The pant is stout and gray- to yellowish-green. 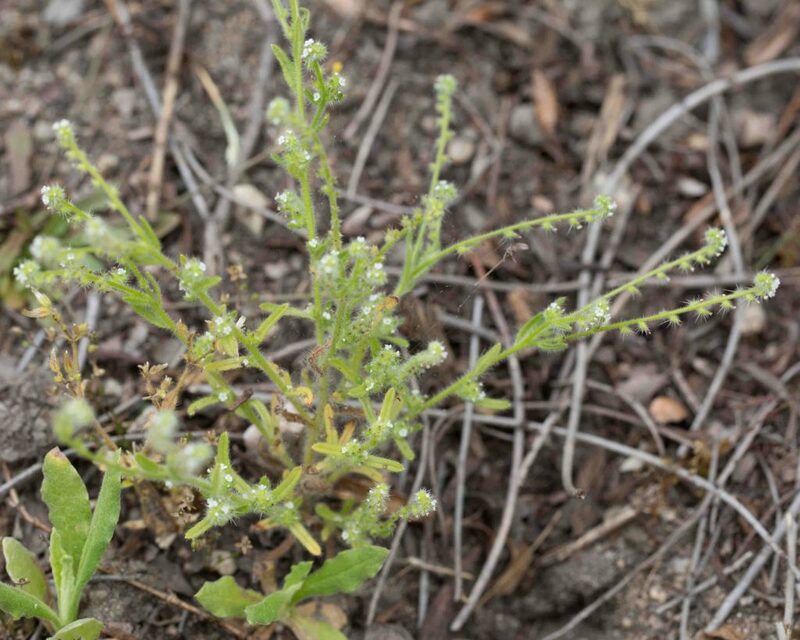 Stems are ascending to erect and hairy, leaves are < 5 cm long, linear to narrowly oblanceolate. 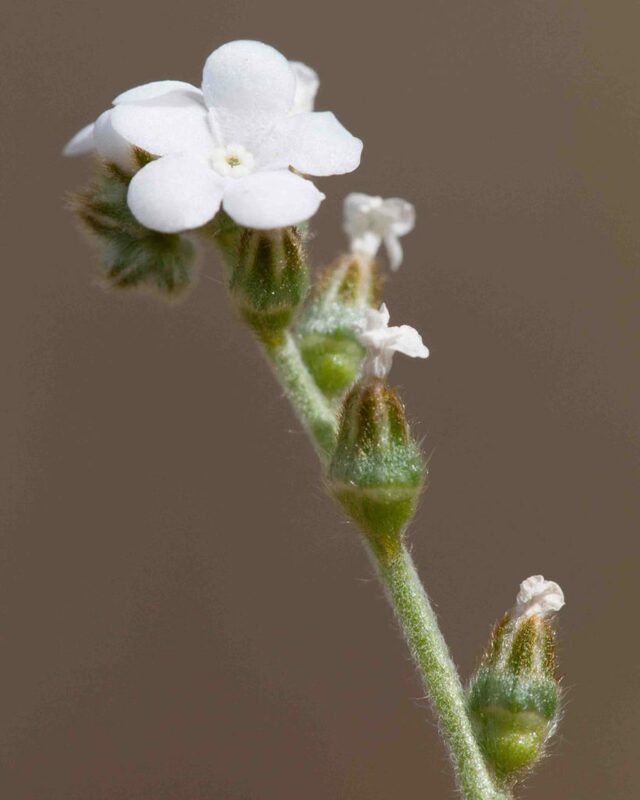 Flowers are 1.5–2.5 mm across. Calyx lobes have rough, bristly hairs. One of the few cryptanthas which stands a chance of being identified by its appearance. 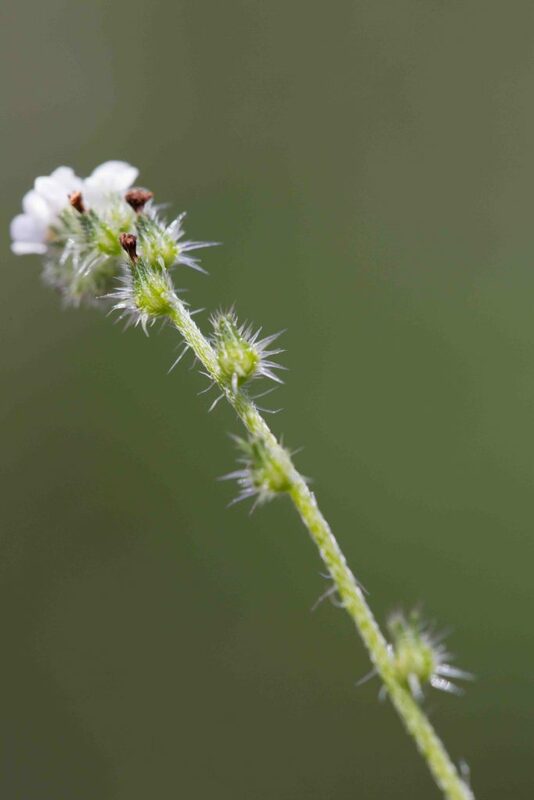 Its flowers are seriously tiny, no more than 1 mm across. To be certain of the identification, one would need to examine the fruits. Each small fruit contains 4 nutlets, one of which is slightly larger and smoother than the others. A good microscope or exceptional eyesight is required to discern this. 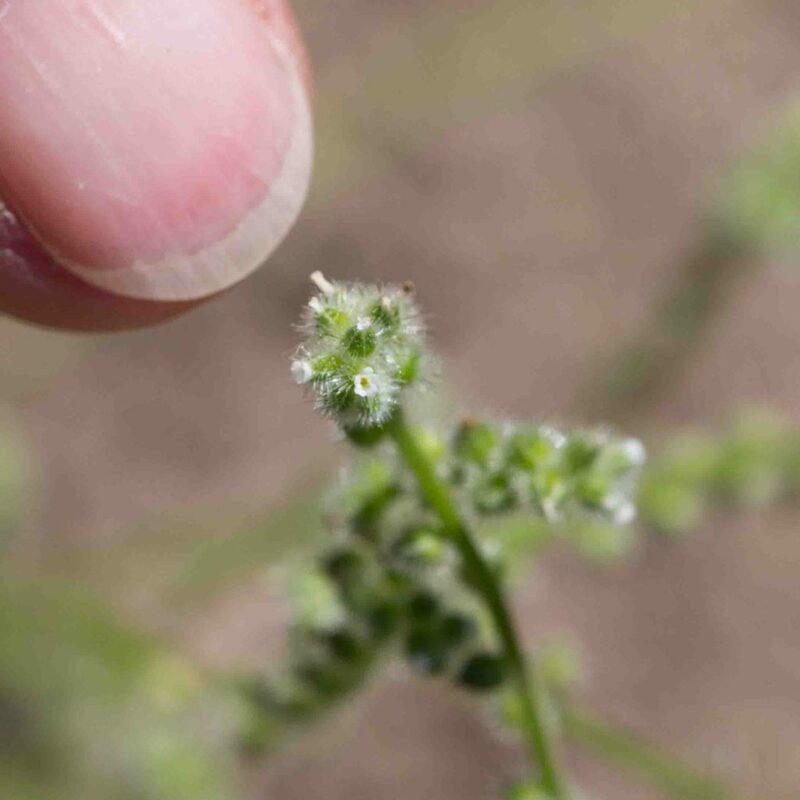 Seriously small flowers (1–3 mm across) but not quite as tiny as those of the Minute-flowered Cryptantha (Cryptantha micromeres). The calyx has noticeably bristly, spreading hairs. It has only 1, symmetric nutlet. Quite common near the coast. The calyx has straight bristles. Flower spikes are generally in 2s and 3s (var. clevelandii, also found near the coast, generally has spikes in 1s or 2s). 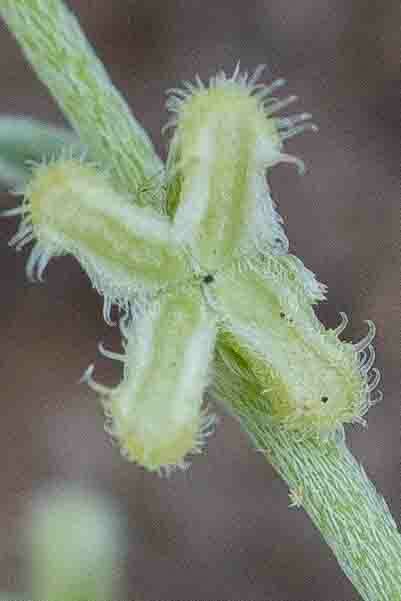 The calyx is not appressed to the stem in fruit. 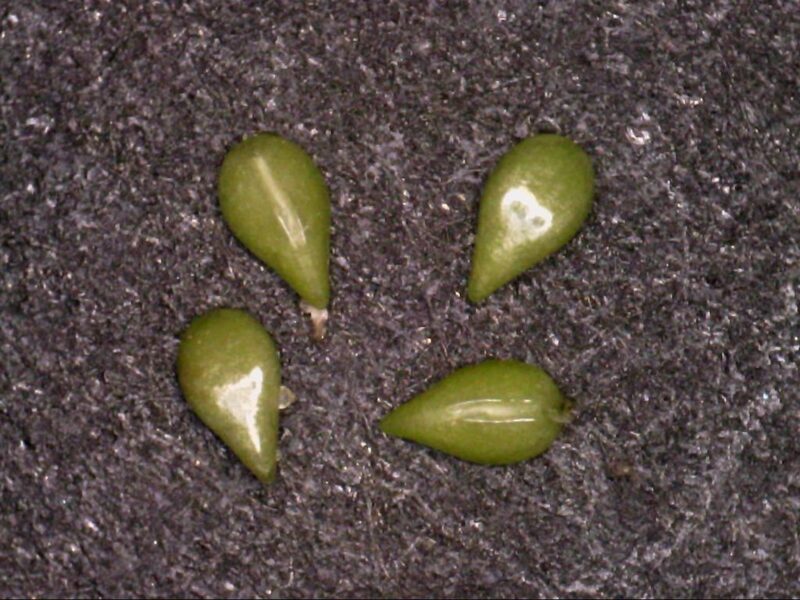 There are usually 3–4 smooth nutlets. 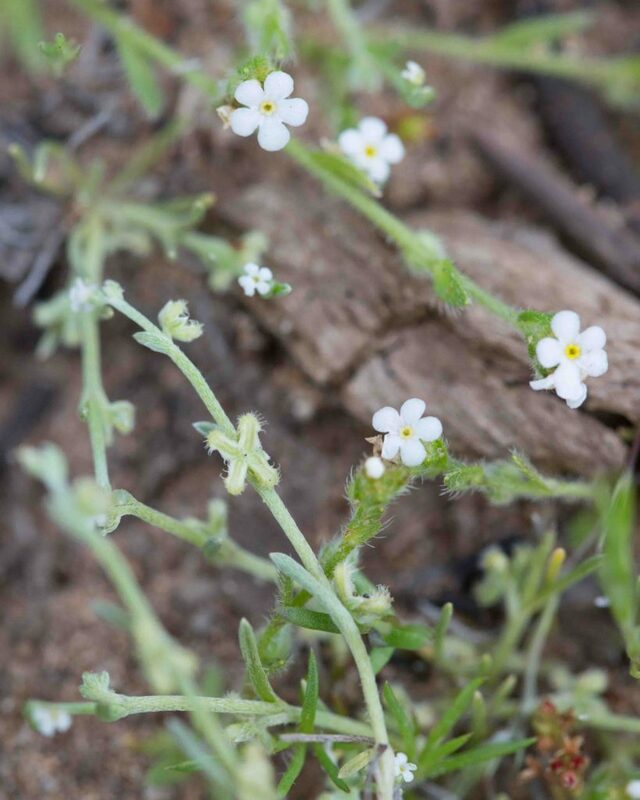 Flowers are 2–5 mm across. Uncommon in Monterey County. 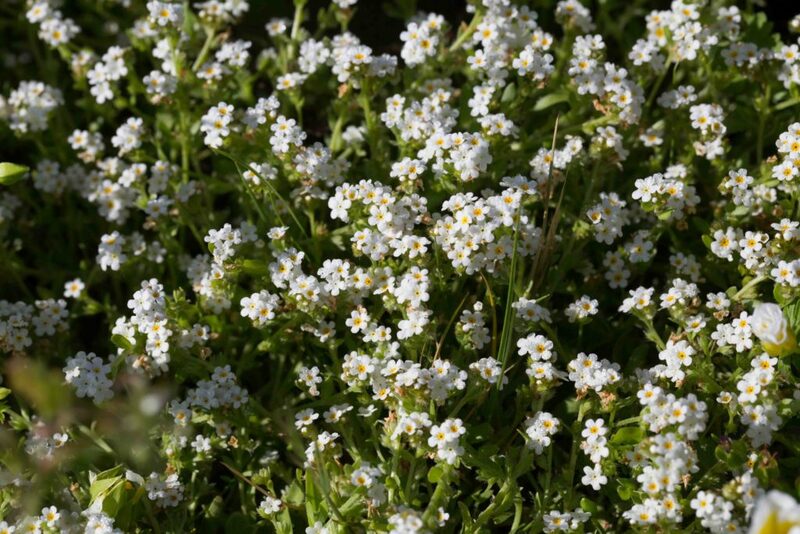 A small plant, even by popcornflower standards, this is most easily identified by its 3–4 smooth nutlets. The calyx lobes have noticeably spreading bristles and are much longer than the nutlets. 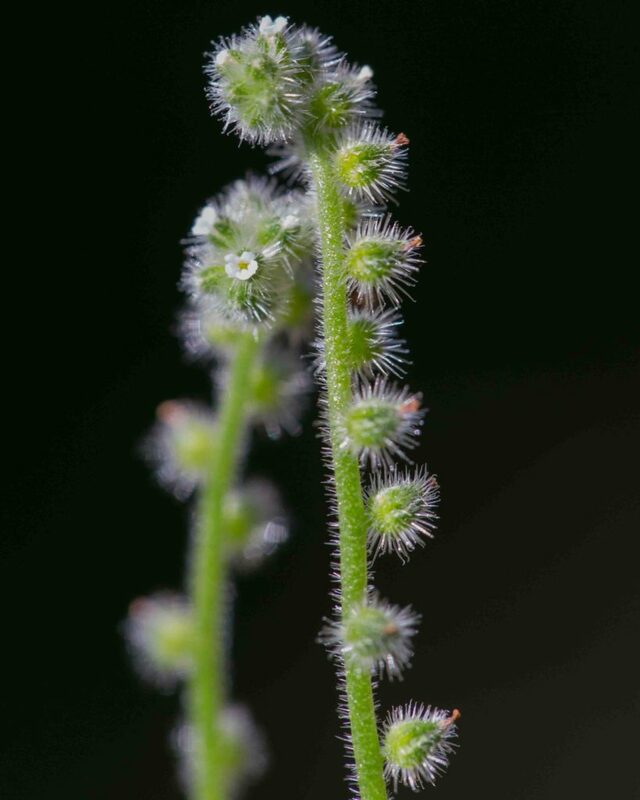 The whole plant is distinctly hairy. Flower spikes are generally in 2s. The corolla limbs are 1–2 mm in diameter. 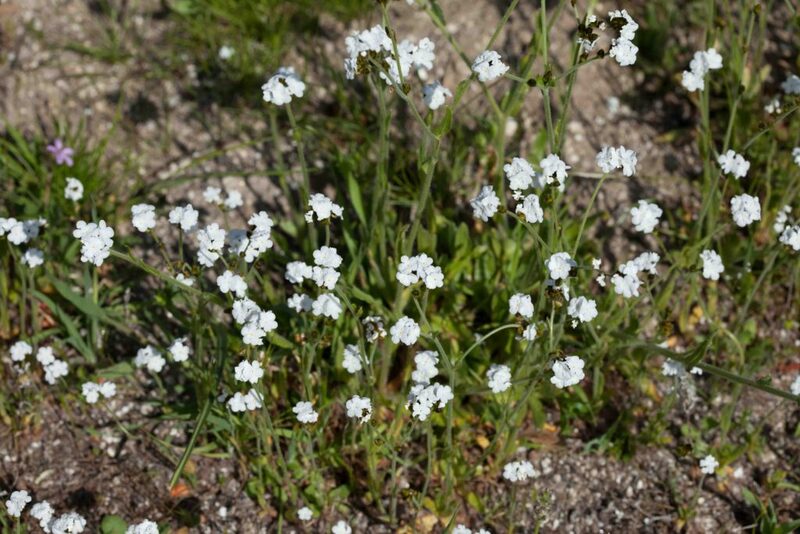 One of the most common popcornflowers on the Monterey Peninsula, found in profusion in open grassland. 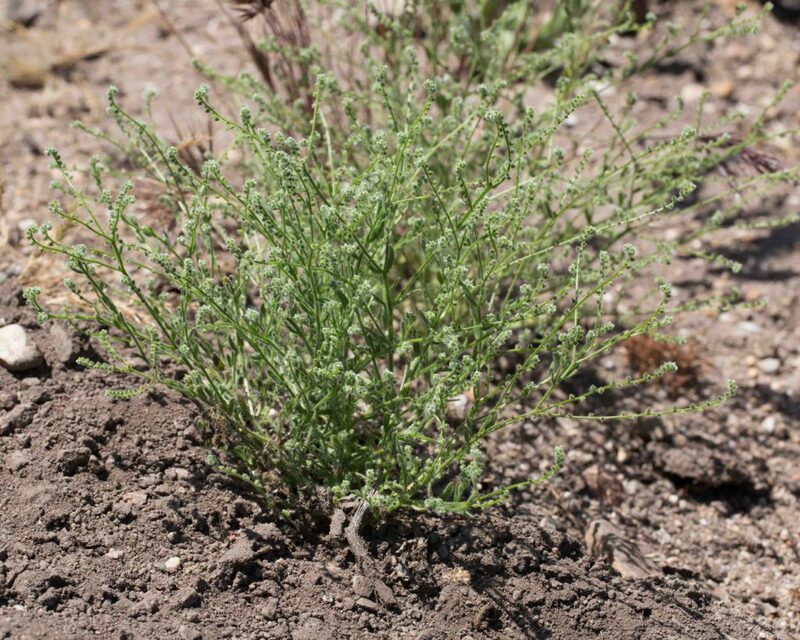 Leaves are mostly basal with some alternate cauline leaves. 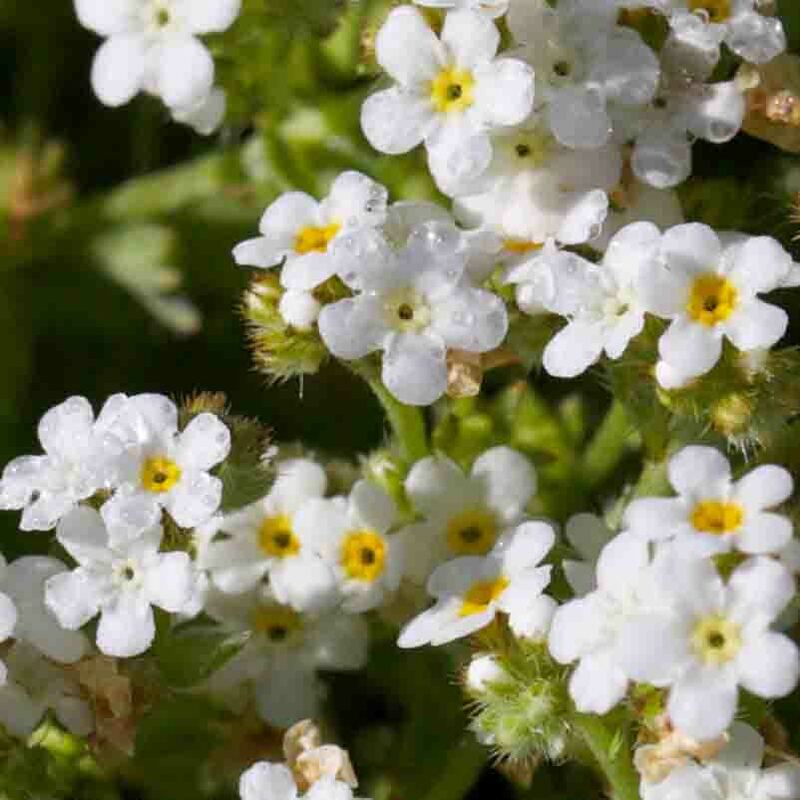 Flowers are pure white, 4–9 mm across. 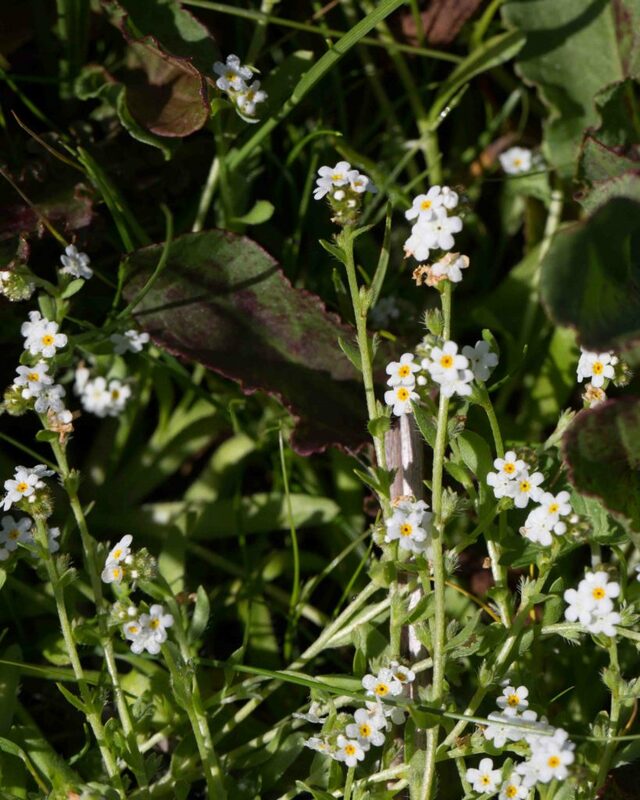 The appendages in the center of the flowers may be white or yellow. The common name derives from the rusty-colored calyx which, unusually, is “circumscissile” so that the top separates from the base like a lid. 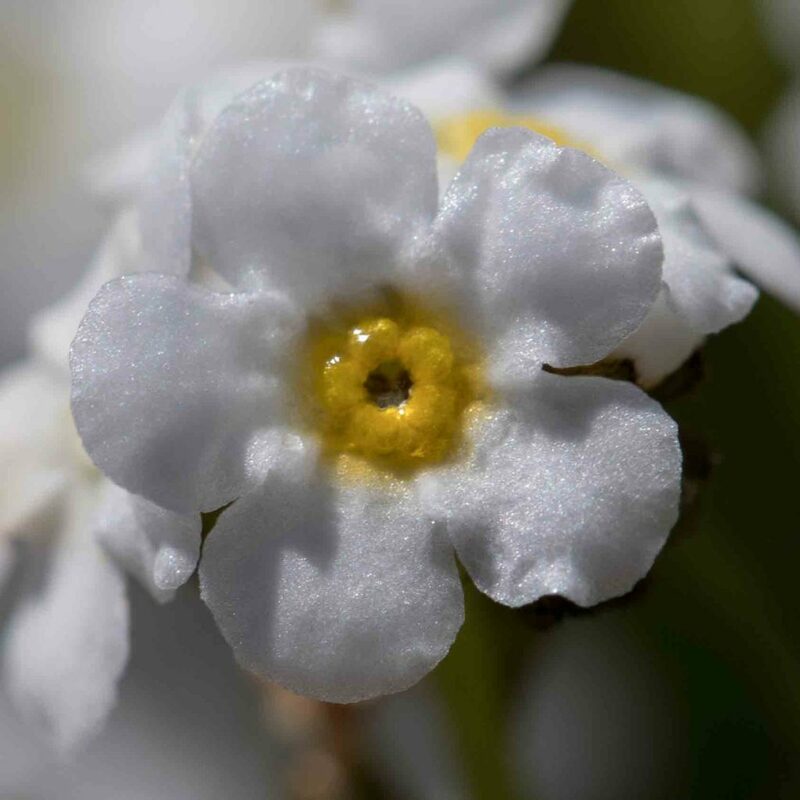 This has comparatively showy flowers (5–7 mm across) for a popcornflower, not unlike those of the Stalked Popcornflower (Plagiobothrys stipitatus var. 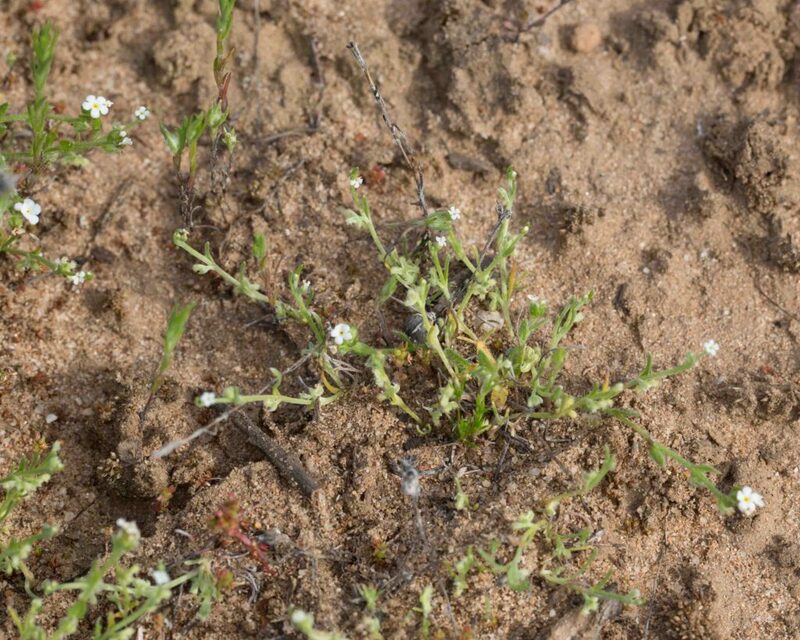 micranthus), which is also found in vernal pools and moist grassy places. 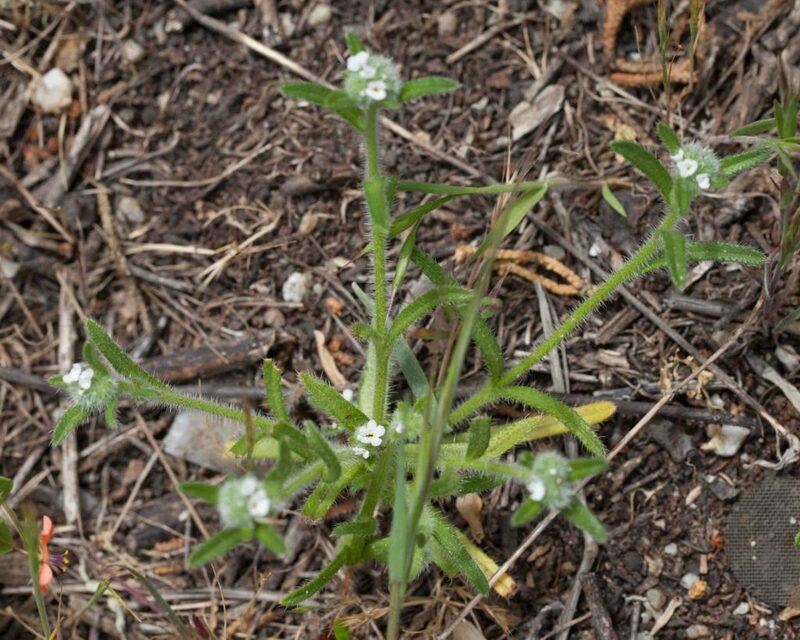 Its leaves are however smooth and without a thickened midvein. 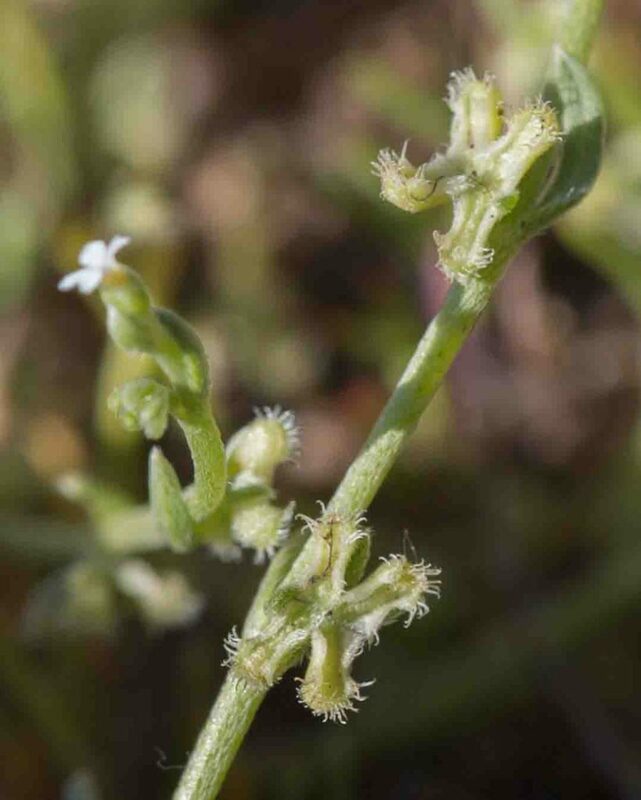 The nutlet attachment is lateral or obliquely basal and lacks the short peg found in the Stalked Popcornflower. 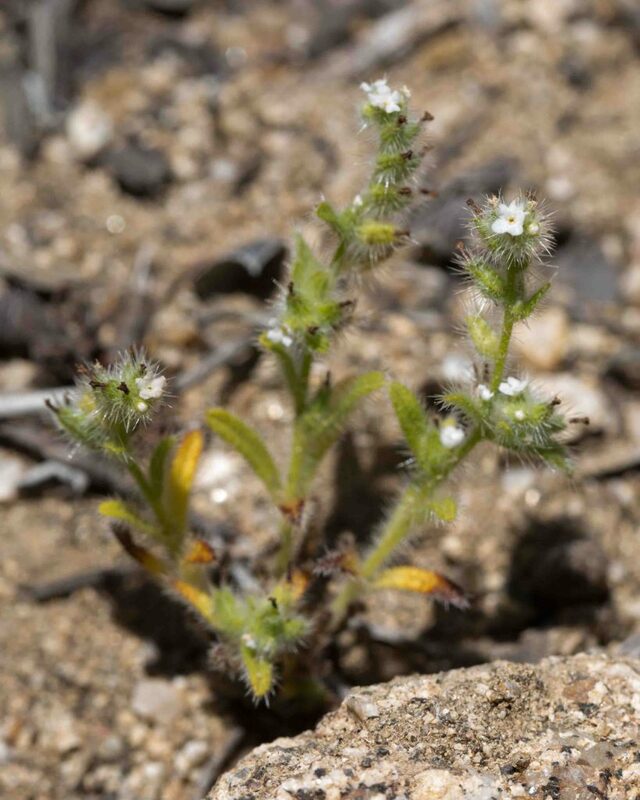 Found around the Monterey Peninsula and in Fort Ord, where it may be seen in large numbers alongside the even rarer Contra Costa Goldfields (Lasthenia conjugens). 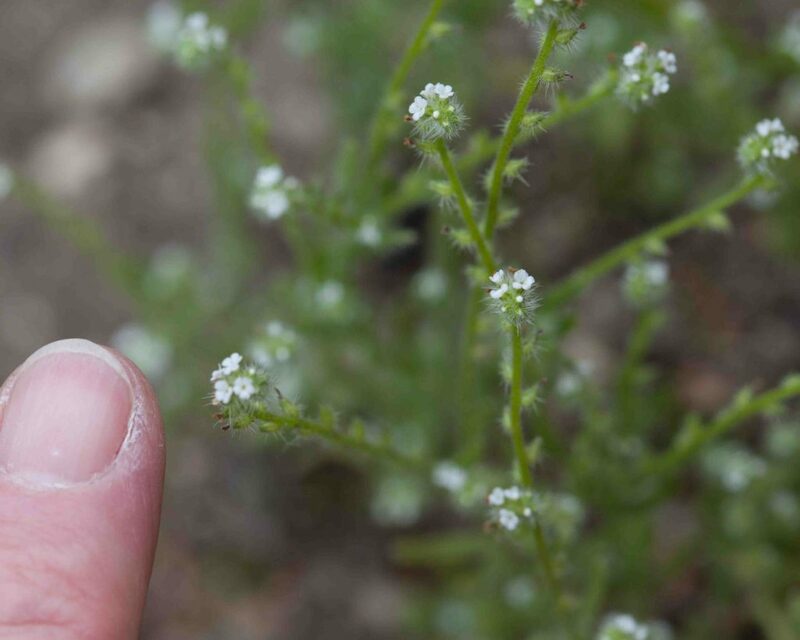 This has comparatively showy flowers (5–12 mm across) for a popcornflower, not unlike those of the rare Hickman’s Popcornflower (Plagiobothrys chorisianus var. 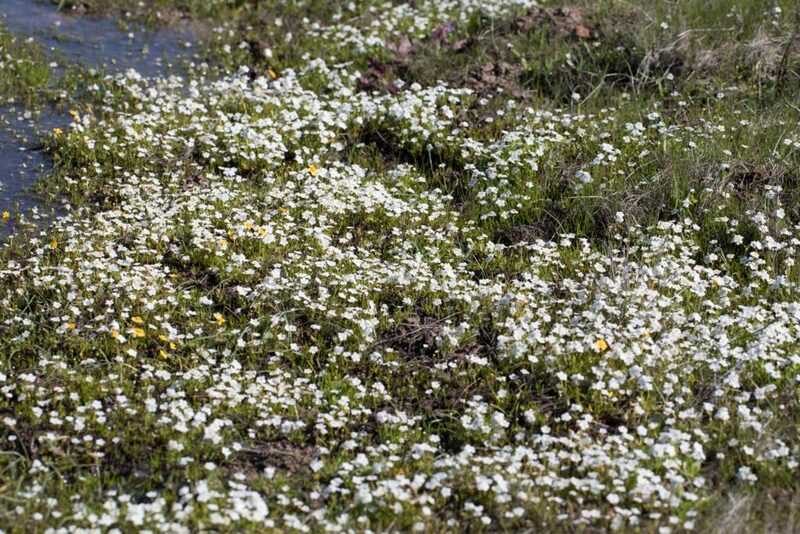 hickmanii), which is also found in vernal pools and moist grassy places. 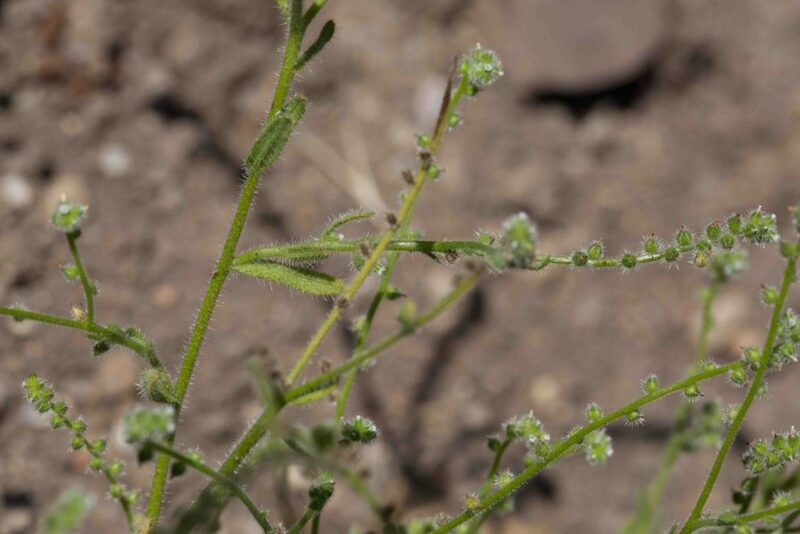 It can be identified by the blister-based hairs on its leaves and by the nutlets which are on short pegs (hence the plant’s common name). Neither of these features is found in Hickman’s Popcornflower. 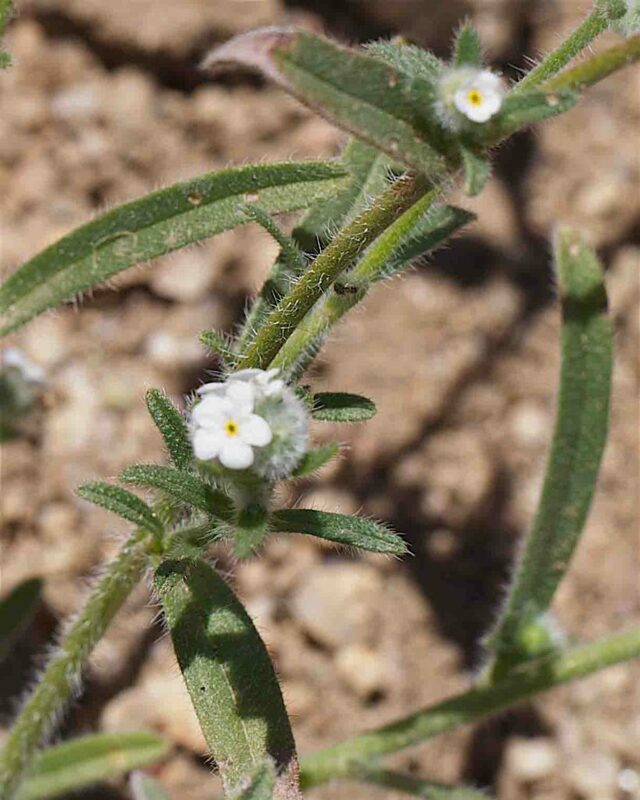 Although Pectocarya is not strictly a popcornflower, its flowers are identical (though somewhat smaller than most (< 2.5 mm across)). This species is however easily identified by its distinct fruits, an X-shaped array of 4 straight nutlets, each lined with comb-like, unhooked hairs. 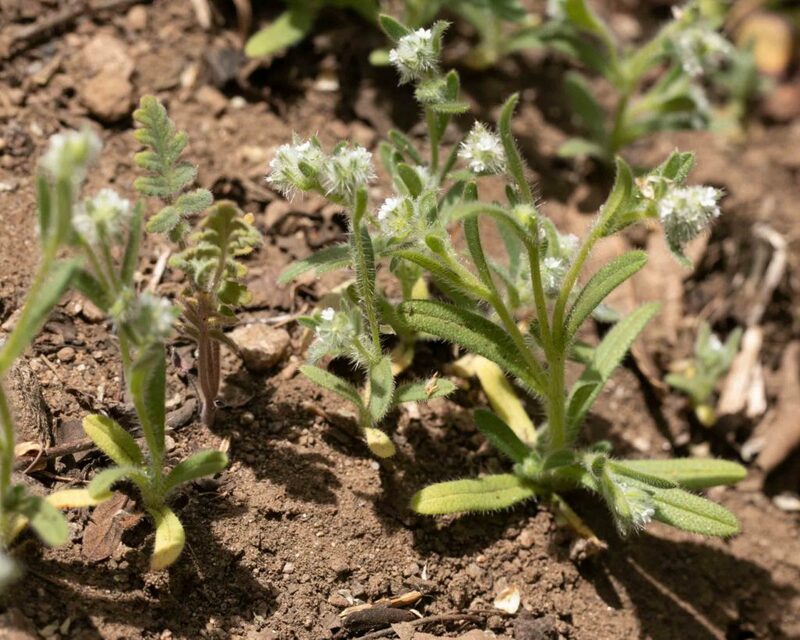 In the third photo from the left, the Pectocarya flowers are the smaller ones, the other, larger flowers belong to a popcornflower growing alongside it.